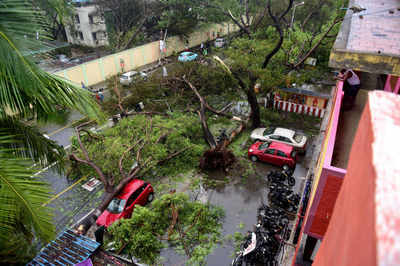 CHENNAI: The revenue administration department of the Tamil Nadu government on Monday released a list of dos and don’ts for the general public after cyclone Vardah wreaked havoc in Chennai and surrounding districts. In a release, the department recommended the following safety measures. 9. Avoid using water, food, medicines that were soaked. Clean and sterilise products before using them again. According to a research by PropEquity, residential real estate valuation in the top 42 cities in India – sold and unsold – will fall up to 30 per cent. Indian realty is now bracing for a sub-prime level crisis, which is expected to deeply impact unorganised real estate and black money, says Samir Jasuja, CEO and Founder of PropEquity. “Out of five buyers, there is only one buyer willing to pay by cheque. And usually, people want to take at least 20 to 30 percent of the amount in cash, but this will now change for the time being. There will be a complete stop in resales in the coming weeks,” he adds. But this will also mean that we can expect formal and organised developers to weather this storm and will relatively be in a better position in the next 9-12 months. “In our view, there will be acute pain in the short-term, but in the mid to long run it will be beneficial as it will create lot of transparency”. So what is the long-term impact of this move on the industry? While such a sudden drop in prices within a short period is rare, the sector will bounce back as almost 80 per cent of buyers are salaried individuals who opt for home loans, says A. Shankar, National Director, JLL. He says construction activities will slow down as a majority of site deals are cash-based, and this would increase completion time for projects. New launches will see a lull period too, but the existing unsold inventory in the market will patch up in this period. Developers, however, have another opinion. According to Dr. R. Kumar, the statement does not mean anything to the organised realty sector. He says the industry comprises different segments, and project sales in an organised market involve a small cash component, if any. “The demonetisation is the best thing that has happened to the industry. Over 10 lakh crore is getting into the banking system, and this will make substantial money available to banks for lending to businesses, construction, infrastructure development, and home buyer financing,” he says. This move is not going to have direct impact on mid-market and affordable housing segments, says Murali, MD, Shriram Properties. “Such reports indicating a fall in land prices and real estate process are not accurate. Yes, there could be some impact on the land prices which may affect the luxury market, but this segment comprises less than 5 per cent of the overall demand in almost all cities.” A surplus availability of funds will also result in a substantial drop of interest rates too. “Getting rid of black money from the system will substantially reduce red tape, approval delays, and other costs,” adds Kumar. Although transactions in most Metros are transparent, the market will slowdown for a period of 2-3 months due to a liquidity crunch. “This setback is temporary and the market will be back to normal by the first quarter of 2017. Developers will not focus on reducing prices but introduce incentives to attract buyers. Residential rentals will see a short-term drop of 10 per cent, but will stabilise once demand grows,” explains Shankar. Anticipating buyer behaviour in this period, Jasuja says most end-users will wait for the prices to come down and delay buying decisions in anticipation of a price crash. “While small retail investors will completely go out of the market enter after 6-12 months, those who have already invested in under-construction properties, will default on their payments to developers as they will fear that prices will fall below their purchase value,” he adds. At the same time, developers are encouraging buyers to not postpone their decision, and are aggressively marketing projects. “Buyers must make use of this period and with a drop in interest rates, they must opt for variable interest rate loans and make their purchase before prices renew. Property prices are likely go up with the introduction of Goods and Services Tax (GST), and the Real Estate Regulatory Authority,” says Kumar.